There are two view homes on one lot. The front house has 2 bedrooms and 1.5 bathrooms. An artist recently renovated this 6 room Arts and Crafts home. There is a wood burning fireplace in the living room, a large formal dining room, 1/2 bath, and laundry plus an office off the kitchen. There are fir floors throughout the home. The property is beautifully landscaped. There are fabulous water and East Bay views. The second home is on the back of the lot. This unique one bedroom home is on four levels. On the lower level is a bedroom, on the main level is a the living space, on the 3rd level is the kitchen and bathroom, and on the upper level is a office/entertainment room with gorgeous views. This charming house evokes the feeling of a Japanese residence. 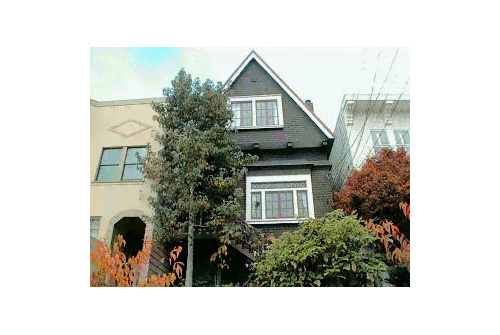 These special homes are located just a short walk away from both Cole Valley and the Castro.